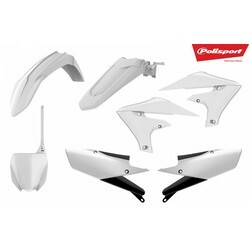 Why are plastic kit parts for Yamaha by Polisport the best choice for your Dirt Bike? * The standard Yamaha MX Replica Plastic kit from Polisport includes a front fender, a rear fender, license plate, fork protectors, side panels and radiator scoops / shrouds. (This can vary from Yamaha model to model, see the images of the individual contents of the Yamaha plastic set of polisport or view our catalog for the exact list of the supplied parts). (This can vary from model to model, see the images of the individual contents of the set or view our catalog for the exact list of the supplied parts).